The most difficult challenge we face approaching a trade show is deciding how to display our product in an interesting and fresh way. We carry so many materials in a variety of great colors that it’s always difficult to choose which products should be showcased and how. 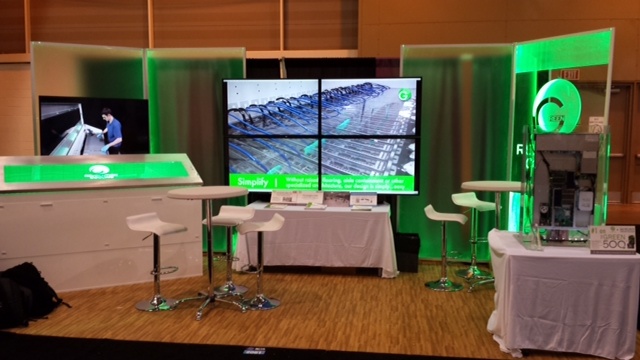 Here are a few tips to help you plan your next trade show and incorporate plastic into the look. 1. Pick a few products to showcase. If you try display everything you carry, your booth will look cluttered. Know your audience and what they want to see or what will catch their eye. It’s important to have a “wow” piece that will pull them into your booth and get them interacting with you. 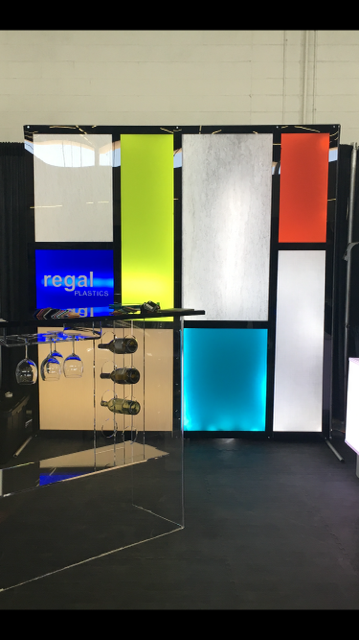 The acrylic back drop pictured below caused people walking by to stop giving our sales representatives a chance to explain what material we used and move their attention to our other fabrication pieces in the booth. Adding lights made the booth more attention grabbing and ultimately created a more success show for us. Acrylic can be used as counter tops, display pieces, or back drops. Its ability to be cut with a CNC, screen printed on, and back lit gives you unlimited design options. Trade show venues rarely have adequate lighting so it’s your opportunity to utilize it! Back lighting your display or adding lights to your sign or table can draw the customers eye to your product. This booth added green accent lights to their white and clear acrylic. It created a cohesive look and a more modern edge. The small touches can pull your booth together and add that professional edge. Customers feel more confident ordering from a company that has a well thought out plan. Think about how you are going to display everything from brochures to business cards. Make everything visible, accessible, and cohesive. Clear acrylic is a great option for a small booth. It’s functional but does not consume as much visual space. 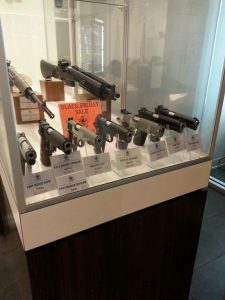 The counter top display pictured below adds another opportunity for branding, and smaller items don’t look like an afterthought haphazardly placed. It doesn’t take much to get your booth crowded at a show. It can be tough to give a potential customer adequate attention and pay close attention to everything that is happening in your space to make sure none of your product sprouts legs and walks off. Consider a custom acrylic display. You can lock up your goods, and customers can still window shop until your ready to help. Not to mention, it’s a great way to add lighting and a professional edge. Tradeshows are an important marketing and sales opportunity for both small and large businesses. 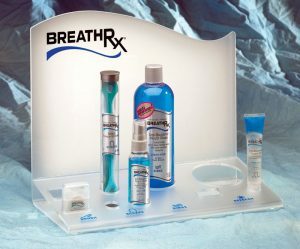 Making updates with custom acrylic displays and lighting, can help display and protect your product. It’s important to remember that small details can make or break a successful presentation.